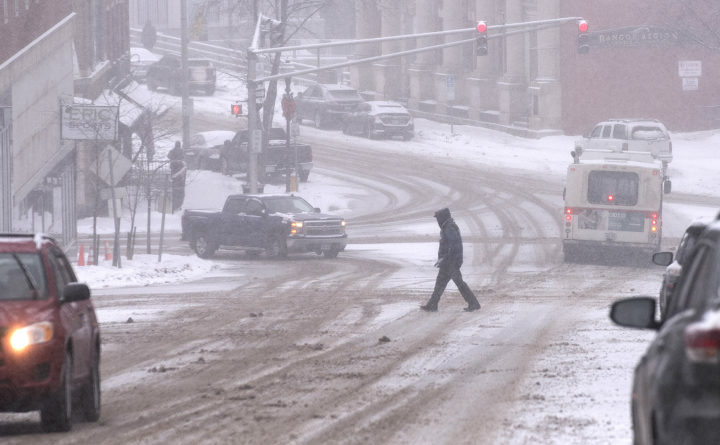 Light snow falls in Bangor in this Jan. 8 file photo. The city is expected to get 2-4 inches Sunday before snow turns to sleet and freezing rain. A snowstorm will hit Maine Sunday morning and transition to sleet and freezing rain over the course of the day, making roads slippery and driving potentially treacherous, according to CBS 13 Chief Meteorologist Charlie Lopresti. Lopresti forecast 1-3 inches of snow along the coast in places like Kittery, Portland, Rockland and Bar Harbor, with locations farther inland — including Lewiston and Bangor — likely to get 2-4 inches before the precipitation turns to sleet and rain. The mountains, where the precipitation will likely stay snow, will get 3-6 inches, according to Lopresti. But the good news will come Monday, when Mainers are expected to wake up to clear skies and temperatures will rise into the 40s.